Over the weekend I cooked a five course dinner for 13 of our dearest friends as a belated 40th birthday celebration for my husband. One of the courses I made was a venison roast with an apricot and cherry sauce. I didn’t need many apricots for the sauce, so of course I had leftovers. I decided to roast them for a day after dessert. Simple, easy and all about summer. Here is what I did. Preheat oven to 400 degrees. Cut apricots in half, remove pit and place them in a cast iron pan or other roasting pan with the flesh side up. Put a dollop of butter in on each half where the pit was. Drizzle them all with a small amount of Grand Marnier and put them in the oven. Roast for about 45 minutes, or until apricots start to caramelize but are not browned. Remove and drizzle with honey. 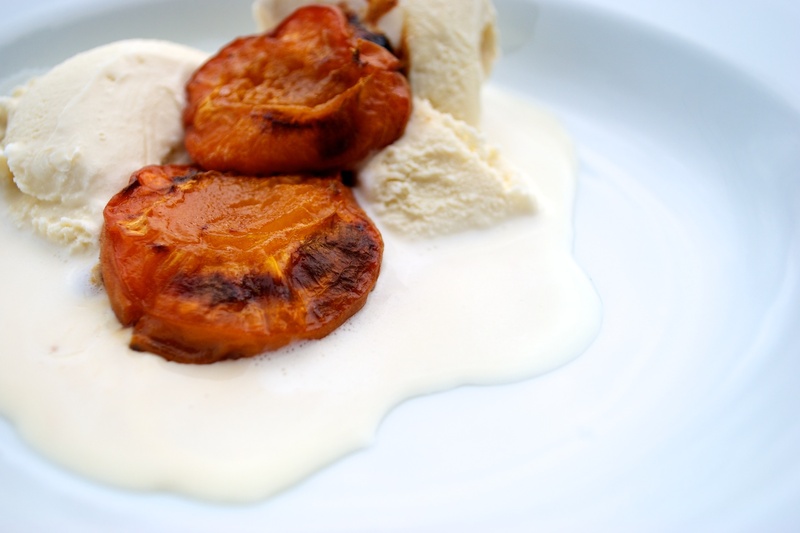 Place apricots in the broiler for 3 minutes or until lightly browned on top. Watch carefully as this will happen quick! Remove and let cool to room temperature. Serve over vanilla ice cream or just pop them in your mouth. So good. So easy.